Pictures from a recent convention show that we might get two versions of Buu out in 2015. Buu is one of the most long awaited toys from the line and this year we might get two versions. 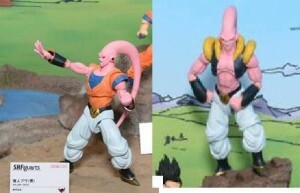 Both Super Buu’s in the picture are based on the same toy frame but look to have different clothes on which mean it could be one toy with optional clothes but more likley it will be two seperate figures. Hopfully we will still get to see a Majin Buu and Kid Buu before the Figuarts Dragon Ball toys stop being made.